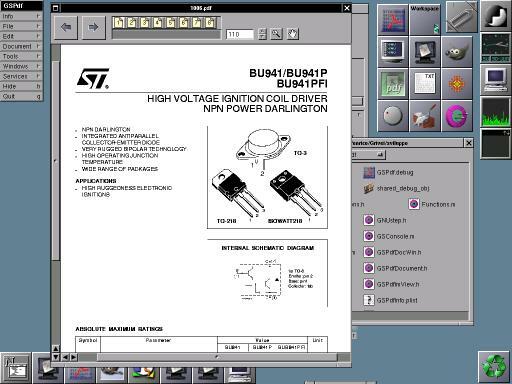 GSPdf is a PDF, PS and EPS viewer for gnustep. GSPdf is a PDF and PostScript file viewer for GNUstep. GSPdf is a frond-end for GhostScript, which is required at runtime to properly render the pages. GSPdf can be used as a GNUstep native Print Preview application, to view the PostScript file generated by it. No further setup is required after installation (and running make_services if installation is done manually). GNUstep-gui will recognize GSPdf automatically. Version 0.4: Zoom and Pan, automatic scrolling to the top and position fixing during page flipping, recent documents. Version 0.3 offers a preference panel so that the user can select the GhostScript binary easily. For packagers it is still advisable to set the default location to the expected path of the operating system. Version 0.2 is essentially a revised release of the original v0.1 written by Enrico Sersale. The makefile was updated to gnustep-make 2, the calls to GhostScript were updated to work with GS v8 too, a ProjectCenter project was added and a bit of minor cleanup of the sources was performed.